In many cultures, the turtle fulfills the cosmic role played by the tortoise. Turtle Island is the name given to North America by many indigenous peoples. The First Nations people called Iroquois (which includes the Mohawk) like many other ancient cultures, feel that nature and its ways are a reflection of the form and behaviour of animals, and vice versa. For example, it is well known that the number of lunar months are embodied in the number of plates of a turtle shell: "13 moons on Turtle's back." Many Eastern North American aboriginal peoples tell how Sky Woman, Atanaesic, fell from heaven to land on the back of Turtle. Water-divers like Otter, Beaver and Muskrat tried to bring up mud to form the earth. Traditions vary as to which one was successful. Sky Woman dies there, giving birth to her twins who embody the principles of Good and Evil. 1975: Sea turtle saves a woman's life. Japanese Buddhist miracle tale about a monk who is saved by four turtles. Once a king had a pool built for the young princes to play in. He installed some fish in it, too. The children ran off to see them and noticed there was another, stranger, animal there. They ran to tell their father the king, thinking they had stumbled upon a sort of demon. The king ordered his men to capture the monster and bring it back to show him. When the turtle, for that is what it was, was brought into the room, the boys began to cry in fear. The king suffered at the sight of his children so afraid, and so he ordered his men to kill the turtle. The men looked at each other and discussed how they would do the deed. "We can pound it to a powder," they said. "Or burn it with hot coals." And one old man who had always been afraid of water said, "Let's throw it into the river and drown it." Now the turtle spoke up. "Sirs, what have I done to you that you would want to end my life in these cruel ways? The first two suggestions were bad enough, but to drown me? Oh, woe is me!" When the king heard what the turtle had said, he knew immediately the right course of action to take. Quick as a wink, the sentence was carried out according to the wishes of the king. And the turtle, after sinking to the bottom of the pool like a stone to fool the onlookers, swam slowly but merrily away. ~ Silhouette by Young, ca. 1912. Here we have a prime example of rebirth, at least in folklore. Cultural anthropologists have names for these similarities -- some of the tales in Jatakas were known at least as early as 200 BCE -- the Eastern turtle trickster is reborn, first in Africa - as a hare? a spider? and then in the West, as "wascally wabbit" Bugs Bunny, who is really a hare. One of the best known Jatakas is sometimes called The Turtle and the Geese. (The link to it is on the Tortoise page.) It tells what happens to a turtle who travels with a flock of geese by gripping a stick in his mouth while two of the birds hold the ends. 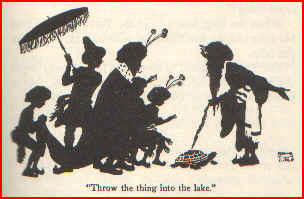 When he cannot refrain from talking back to a group of children who remark on the unusual sight, the turtle naturally falls to his death. The moral: "Disaster can come from opening your mouth at the wrong time."